In just under a months time I will be turning my trousers brown before placing myself upon a small stage and speaking for just 2 minutes at 20x2 v7.0, a small event that takes place during the SXSW Music, Film and Interactive Festival in Austin, Texas. Once again, it’s due to me knowing Jon Roobottom that this came about. Jon did this event last year when the event travelled outside of Texas for the first time and landed in London. My excitement in his appearance led to 20x2 organiser Kevin Newsom asking if I would like to take part in a show too, which was an opportunity I leapt at. Now it’s time to get my thinking cap on and think about what I’m going to spend the 2 minutes talking about. Whilst 120 seconds isn’t a long time, it probably feels like 120 days when you’re up there. Right now there is a blank canvas, which I guess is the epitome of ‘What If’. 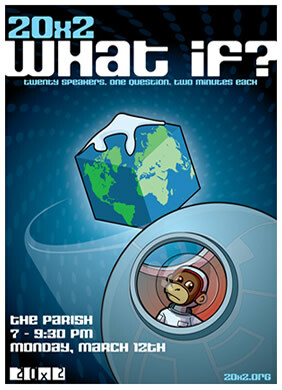 If you’re at SXSW, you can catch the show on the Monday evening at The Parish above Jazz, 614 E 6th Street. The show begins at 7pm. See you there!